Napster, Napster, Napster. First you set the music world on fire (along with the legal system). Now you’re sort of an also-ran. In yet another attempt to return to glory, Napster will rely less on its desktop client in favor of a Web-based approach as it hopes to attract more paying subscribers. Napster seeks to make its platform more flexible and compatible with any Internet-enabled device with the release of Version 4.0. The move will allow Napster’s 770,000 subscribers to play their music from any computer without having to download additional software. 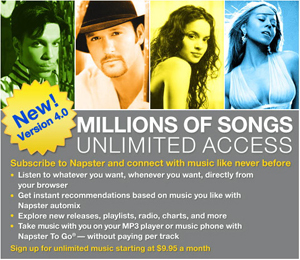 Before today, Napster subscribers could only listen to their music after downloading the desktop client to their personal computers, although the Napster software is still required to transfer music from the service to compatible devices. Napster sells music subscriptions for $10 to $15 a month, where customers can stream or download an unlimited number of songs from the company’s 5-million-song library. “With this new platform Napster can easily be integrated into consumer electronics devices or integrated into other Web sites such as social networking sites,” said Christopher Allen, Napster’s chief operating officer. During the news conference, Allen said he believes the digital music industry has reached a “turning point” where all music sold will be free of digital rights management (DRM) by the end of 2008. So far, only Universal Music Group and EMI group have been selling music without DRM. “When you take the same tracks you purchased on Napster or other services and play them on your iPod or mobile phone, it will help to increase the exposure and the value of subscription services as the market opens up,” Allen said (Reuters). First of all, tracks are “rented” — not purchased — through Napster’s subscription service (although the company also separately sells download-to-own tracks) and they cannot be played on the iPod, the industry’s leading portable digital music device. Subscription-based services like Napster are predicated on DRM. As long as a customer pays the monthly fee, the music plays. When the customer stops paying the fee, the music is no longer playable. Therefore, how will DRM-free music “help to increase the exposure and value of a subscription service as the market opens up”? For Allen’s statement to make any sense, Napster, which is said to be getting ready for the arrival of industry-wide DRM-free music at the end of 2008, is going to have to change its subscription model one way or another.